Whatever some may think of whether or not Extinction Rebellion's protest tactics are appropriate ones, at least they are talking seriously and positively about the need for a livable planet. If we’re waiting for some politician to fix this climate change chaos we have a very long wait, possibly past civilisation's expiry date. Capitalism is prepared to sacrifice human health and the environment to capital's insatiable hunger to grow. People are engaged in continuous battle against industry and transport that spout poisonous fumes and waste from smoke stacks and exhaust pipes. We must expose those that pollute streams, lakes, sea, with their effluent and raw sewage. We must bring every social, political and educational pressure against such abuses as over-grazing of the range and intensive crop practices. We fight destruction of the forests and resist urbanisation of populations in vast industrial centres. Socialists are committed to a reverence for life rather than the frightening hazards of production under socially irresponsible ownership bent exclusively on profits. Stewardship must take the place of the befoulment and destruction of mankind’s environment. There are a number of environmental problems with capitalism such as that the capitalist class and their CEOs don’t actually care about anything other than the accumulation of capital and profit. They have always been perfectly content to profit from anything and everything. Their contempt for human life and dignity is glaringly obvious. The media is not interested in talking about why society places profit over people, believing it is better to avoid such fundamental questions and instead debate environment tax measures, carbon trading transactions and new emission-reducing technology. The solution is to take the use of science and technology out of the hands of a handful of profiteers and make it accountable to and controlled by a harmonious socialist society will it be possible to really harness science as a mighty lever for benefiting mankind and the environment instead of destroying both as is the situation now. Business logic will always use capital in the same way: cheating and speculating at one thousand percent, raising their champagne glasses to the coming if not of the next drought, then of the next flood. Today any transformation of the technical and natural environment is a possibility. Today we have the capacity to turn the world into hell, and we are well on the way to doing so. We also have the capacity to turn it into the opposite of hell. We live in a world dominated by capitalism. It is capitalism that brings about great inequalities in living standards, starts murderous wars to steal resources and causes the growing devastation of our natural environment. Either we get rid of this outmoded and increasingly decrepit system or it will devastate humanity. The hour is late and urgent action is necessary. 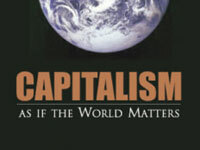 People know that capitalism is no good but few can see a way forward to a better type of society. Civilisation can be saved only through a social revolution. All the conditions for revolution are prepared by the uninterrupted series of economic, political and military crises into which society is plunged by capitalism. Human beings cannot continue to live indefinitely in a society that totters on the brink of the abyss. When the transformation in mass ideas come, it heralds a revolutionary situation where the tempo of revolutionary events grows more rapid. The revolution is precisely a revolution by reason of the fact that it permeates every nook and cranny of society, leaving nothing untouched. The only viable way forward is to achieve socialism, a class-free and state-free world where people do not oppress and exploit each other and where we live in harmony with our natural environment. To create a socialist world it is necessary to overthrow the rule of capitalism and this can be done only through revolution, deposing and dispossessing the capitalist ruling class to establish socialism, a system of real, popular democracy that sets about the reconstruction of society. The purity and integrity of air, water, soil, are vital. What we need is a red revolution, not a green one.